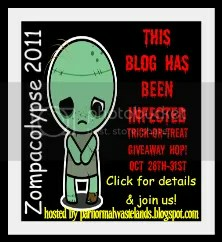 ← Zompacolypse 2011 Trick-or-Treat Hop! Congrats to AmyS., who commented that they would be dressing up as a zombie this year. Awesome costume choice! Zombies never go out of style. Amy, please check your email for further information. If I do not hear back in the next 72-hours, a new winner will be chose. Thank you everyone who participated. This Halloween Hop has been really fun and I look forward to hosting more book-related giveaways in the very near future. Stay tuned!